GoNoodle is an amazing and beloved kids brand, with hundreds of movement and mindfulness videos that are played by millions of kids in a majority of elmentary schools. During my time at GoNoodle as creative director, I led the redesign of our brand with some help from 2V to better represent our rapidly growing place in the kid's entertainment space. We completely reinvented the brand's look with a bold new logo, bright and electric colors, shapes, and patterns that were inpsired by kinds of energy we saw in the kids that dance along with GoNoodle everyday. In updating the logo, we really wanted to maintain the recognition that our current customers had, while boosting it's presense to be more distinct and flexible in applications from the big screen to your smartphones. The "oO" of the original GoNoodle logo had been frequently used as eyeballs in animations, so we pushed it even further, creating a unique smiling face that can be extracted from the logo to be used as a standalone mark and avatar. 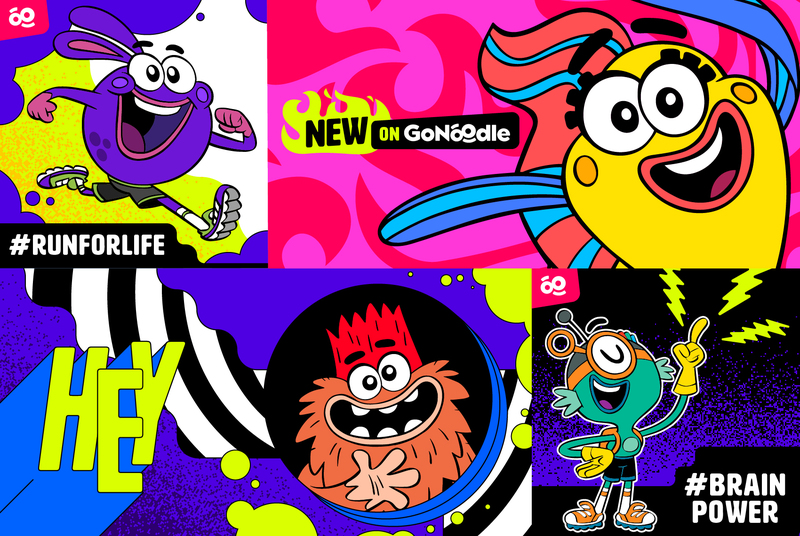 These are just some of the 25 original "champs" I had designed for GoNoodle years before the rebrand. They basically act as cheerleaders for classrooms that encourage the kids and evolve along with the play activity. As the company grew, we realized the need to update these brand avatars from "flat stickers" to more robust character designs that better infused their growing personalities, and that we could translate better to animation. We were so lucky to work with Miah Alcorn and Cedric Hornstadt to refresh the designs for the rebrand! A big part of the content we made at GoNoodle was sponsored videos. We partnered with some of the world's biggest kids entertainment brands to help promote movies and tv shows like Nickelodeon's Henry Danger, Pixar's Finding Dory, Warner Brother's Smallfoot, and more. Our dance video for Troll's Can't Stop the Feeling has over 61 Million views! Here is a video I created for Disney's reboot of Ducktales.